“Statements of Support and Encouragement” – the first two pages have space for our support people to write statements of support and encouragement for our journey through the pathways of recovery. “Table of Contents” – a detailed 7-page table of contents not only lists the chapter titles, but also the major topics or sections in each chapter. “Introduction” – the book opens with a general introduction to the program. “FAQs and More” – an opening section that answers several “frequently asked questions” about the program and workbook. “An Overview of the Three Mind States” – a two-page chart describes Emotional Mind, Rational Mind, and Wise Mind so folks have a general idea of what these are before they begin reading the book. In addition, various emotions are listed with examples of the types of emotional thoughts that go with them. Then, examples of how Rational Mind and Wise Mind might respond to these emotions and thoughts are listed. “An Overview of the DBT-CBT Process and the Pathways of Recovery and Relapse” – a flowchart shows how we use Emotional Mind, Rational Mind, and Wise Mind to deal with difficult life events and emotions in a healthy, recovery-based way. The chart also shows what happens when we act on our emotions without using Rational Mind or Wise Mind. A written description of this process is also provided. 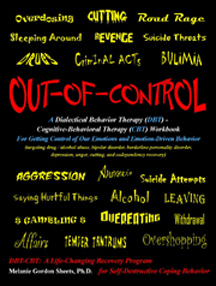 This also serves as a very good overview of the DBT-CBT program. “How Bad Do I Really Want Recovery?” – an introductory worksheet to help us gauge our readiness for recovery…before we get started with the workbook. “Rest Stops” – the 14 chapters are divided into three sections. After each section is a “Rest Stop” which provides a summary of each chapter in the section, “Where We’ve Been…What Ground We’ve Covered.” The Rest Stops also tell us “Where Do We Go from Here” or what we are getting ready to cover in the next section or sections. “Applications” – the “general knowledge” information presented in the workbook is applied to situations that are familiar to us. The information is applied to Real Life…and often it’s our life that it’s applied to or the lives of people we know. “Skill Builders” – these are activities and worksheets that help us to practice and apply the skills and concepts we’re learning. Several are highly therapeutic and will lead us to major insight, self-understanding, and change. Workbook Questions – the pages of the workbook are FILLED with “workbook” type questions. These help us to process the material and apply it to our life. “Answers” or comments can be found in the text following most questions. “Chapter Reviews” – each chapter ends with a set of questions about the material and space for writing responses to these questions. “For Reflection” – at the end of each chapter is a lined space to “journal” or write. We’re encouraged to write about whatever comes to mind or heart. Some ideas for what to write are listed in the margin…such as how the material relates to our life, how it affects us, motivates us, what we have learned, major insights, etc. “The Concepts and Skills Tracking Sheets” – worksheets at the end of each chapter which list the major concepts, principles, understandings, and skills presented in the chapter. They are a tool to help us learn, practice, and apply the skills and information in each chapter. They help us to remember what we’ve read and they offer a way to TRACK our practice and Real Life use of the recovery skills and understandings. Definitions – easy to understand definitions of words used in the text. “Phonetic” or “Sound-Out” Spellings – spellings of less common or hard to pronounce words. “Footnote Style Numbering” – the margin items listed above are numbered and the section in the text that they go with are numbered (footnote style). This is so we know how the margin information connects to the text…to know when it should be read. Quotes and Sayings – the margins are also used for quotes and sayings that relate to the text. “A List of Negative Emotions” – a fairly long list of unpleasant, upsetting emotions. Similar types of emotions are grouped together. This helps us to be aware of the emotions we experience and it gives us words to describe our feelings. “Turning Point Worksheets” – listed below are SOME of the worksheets that have had the greatest impact on Group Members. “The Cycle of Suffering in My Life Worksheet” – helps us to understand how the problems we’re having in life are greatly worsened by how we are trying to cope with them. It shows that the things we’re doing to try to feel better in-the-moment end up causing us long-term pain and suffering. “The Mindfully Protecting My Peace and Stability Worksheet” – helps us to understand the number of stressors, pressures, demands, and difficult things “Coming Our Way” and the importance of being mindful of these things, maintaining boundaries, prioritizing, and coming up with a Game Plan for managing what’s “Coming at Us.” The purpose is to protect our peace and stability and the quality of our life…to minimize Emotional Mind flare-ups and crises and relapse into self-destructive coping behavior. “The Challenging Negative Judgments of Me Worksheet” – provides us a structured way to rationally challenge the abusive, hurtful, destructive statements made about us. Members are often shocked at the results of this worksheet because it shows or “proves” how much of a lie those statements were…and how irritational we are to continue to believe. “The Well Analogy Worksheet” – helps us to talk our way through an Emotional Mind crisis or situation…to go from impulsive coping responses to a Wise Mind response. “The Wise Mind Worksheet” – walks us through the use of the three mind states so we can come up with a Wise Mind plan for dealing with a major issue or problem. “The Game Plan” – this worksheet is for the development of a personalized recovery plan. The principles, concepts, skills, and understandings gained throughout this workbook are used to develop this recovery plan. The use of Rational Mind and Wise Mind are built into the plan as is a respect for our Emotional Mind issues and dynamics and who we are and how we are as a person. “Step-by-Step Instructions” – detailed instructions are provided for the completion of the worksheets and tracking sheets. “Samples of Completed Worksheets” – one or more completed samples are provided for each worksheet. These aid in understanding how to complete the worksheets. Oftentimes, seeing how a worksheet is done helps to better understand how to complete it! Many of the completed samples are used for discussion in the workbook, too. “Real Life Stories” – four stories that describe the life events and situations common to a recovery population are shared. Many Group Members feel as if these stories were written about them…sparing some details.